I partnered with my mother to start extreme couponing. Well not as crazy as the show but enough to make a dent and start saving for an XBox and Kinect. Dear XBox if you are reading this and want to send us one for free, let me know. I will test it out for you. Anyway, we did our first shopping trip before Thanksgiving and we ended up paying $130 for a week's worth of groceries for three, plus Thanksgiving dinner for six. Not too shabby if you ask me. 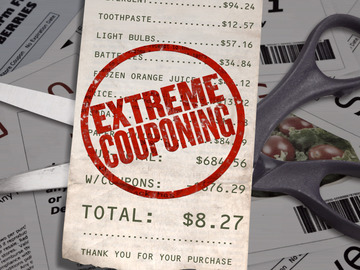 Tomorrow we are going on our next couponing adventure. It's weird how spending time with my mom cutting coupons, grocery shopping and planning weekly dinners is now fun. I must be getting old. Look out advertisers, I'm becoming your target market. Subscribing to the Sunday newspaper - You can get the AZ Republic for $4 a month and that includes Wednesday which is another big day for coupons. Cutting out any coupon you could potentially need and file it - We started using one of the empty file drawers in my home office to keep everything labeled and organized. Create a filing system and stick to it - We have also started using the computer to catalog the coupons we clip every week but we only have about 50 coupons right now. If you are interested in the inventory document we set up, please leave a comment below. Stock up on any non-perishables when you can get the best deal - Just make sure you have the room so you don't appear to be a hoarder. I know you might think this is a really random blog post. But think about it, in the world of advertising you've probably at some point and time designed or dealt with FSIs but how many of you have actually used them. We don't really deal with retail clients anymore at our agency, though if you do, try using the coupons in the Sunday paper. It will give you a great eye opening lesson on how your clients should or should not be designing their FSIs. Happy to update we saved 23.9% more than we did the last trip to the grocery store. It's definitely hard work and REALLY time consuming, but so worth it. We saved more than we spent at every store and made a profit at one of the stores. This is a really good feeling.